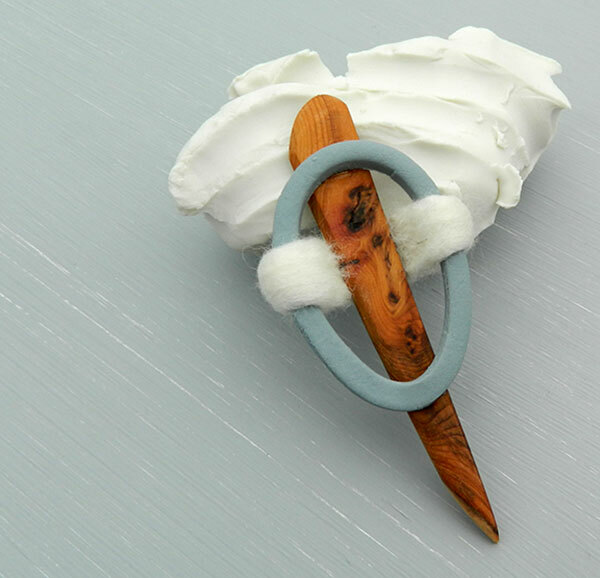 Rebecca Ridley is a contemporary craft maker, creating jewellery that sparks the senses through visuals, sounds, contrasting textures and scent. Rebecca wants senses to be enveloped when a piece of her jewellery is worn, bringing joy to the wearer. Inspiration for Rebecca is found in a variety of places, most prominently in the materials themselves and in a playful exploration of the materials and processes. With inspiration for contrasting textures being found in Northumberland countryside, and with shape and form being inspired by the shapes present in Antoni Gaudi’s architecture. Porcelain creates the perfect base for vibrant bursts of colour, and produces a delightfully dry chalky sound when rubbed together, while the carved Ash exposes organic textures and a velvety smooth surface which is accentuated by the simple form. Both materials are united by the delightfully soft Merino wool. Materials are all sourced with sustainability in mind with the Ash being recycled from workshop offcuts and porcelain being bought locally from Stock-On-Trent. Rebecca enjoys the freedom of creating jewellery in a fluid way – designing as she makes – which results in idiosyncratic and charming objects. Realising the importance of handmade objects in the current climate of mass-produced products, Rebecca is mindful to allow all the components she creates to be distinctive and for each of them to take on their own characteristics.